The act or instance of traveling by potential customers (like leads and suspects), actual customers and ex-customers (from your company and other companies), by going from one place to another place (real world and online), visiting touch points of organizations, exposing and showing their needs and requirements, buying, using and experiencing propositions, offerings, products and services, doing complaints and recommendations to organizations. The definition of a customer journey is: The act or instance of traveling by potential customers (like leads and suspects), actual customers and ex-customers (from your company and other companies), by going from one place to another place (real world and online), visiting touch points of organizations, exposing and showing their needs and requirements, buying, using and experiencing propositions, offerings, products and services, doing complaints and recommendations to organizations. A customer journey is a simplification or a model of a series of experiences, focused on visits, touch points and interactions with organizations or companies providing products and services. The purpose or goal of a customer journey is, on the one hand, to measure and evaluate how well you are servicing your customer in line with your strategy and to improve your current delivery of service. On the other hand to find out what has changed in the lives of your customers (potential, actual and ex), why they are visiting your competitors and not you and to come up with ideas for new services. This all actually leads to a better understanding and servicing of your customer. You focus on what your customer thinks, feels, need, wants, says, shows and tells. You will know what people want and need to become and stay your customer and you will certainly know how to prevent them from going over to your competitor, or even prevent them from visiting, investigating or knowing about your competitor. A customer journey helps you to look outside-in instead of inside-out. You broaden your scope and view. And you prevent tunnel vision and self-fulfilling prophecy. Screenshot of a journey created by a user on Dragon1 and used in production at their company. Customer journey mapping is an easy way to visualize a possible or potential scenario or to map the experience throughout an existing service. Create a trial account on Dragon1 and start mapping your customer journeys to get more new customers and service actual customers better. In the example above an overview of a customer journey is provided. With only one touch point with your organization. It is common practice to next zoom into or detail that single touch point in a series of touch points with your and other organizations. For instance if they search online, the first organization they will touch is often Google. 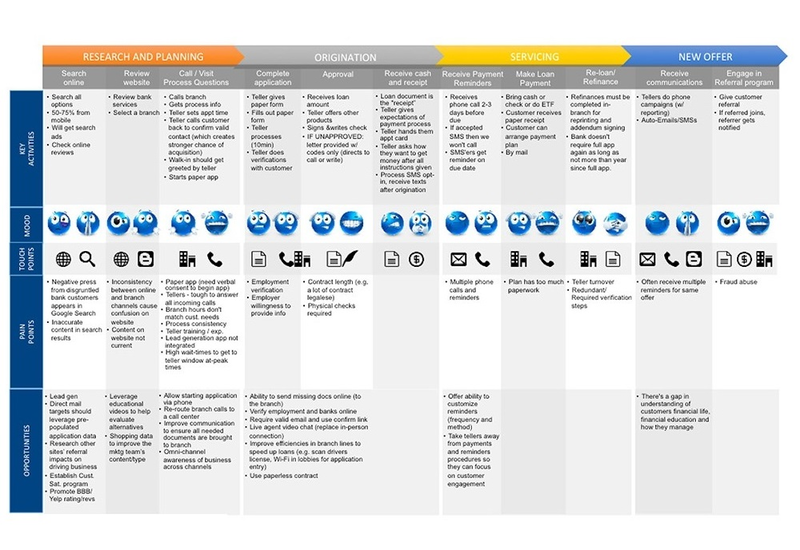 Below are some examples of detailed mappings of Customer Journey. You see in every visualization a series of experiences and for every experience the pain points and opportunities are measured or defined. In some mappings you make it even more explicit by showing what a customer wants, feels, thinks and does. By creating such a detailed mapping you will definitely be able to improve the experience of your customer and increase your sales. 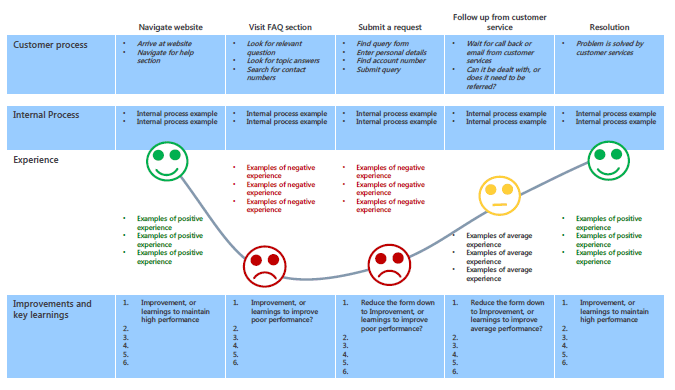 Screenshot of a Customer Journey. Congratulations! You have made it to the bottom of the page. And we will reward you by telling some secrets on Customer Journey mapping. There are many secrets to a successful customer journey mapping and improved customer service. We will mention here six secrets. - On this page, we have provided you with an overview diagram and four examples of Customer Journey mappings. By reusing these diagrams you actually reuse years of knowledge and experience of the experts from the field. On Dragon1 PRO we provide you with four templates and a checklist to create a customer journey map in no time. - The Net Promoter Score®, or NPS®, measures customer experience and predicts business growth. Measure your NPS before and after using a customer journey. - Customer loyalty is the result of consistently positive emotional experience, physical attribute-based satisfaction and perceived value of an experience, which includes the product or services. Focus on how loyal your customers are or not are. Why is that? How loyal are customers to your competitors and why is that? - How much effort does a customer has to put in to acquire your product or make use of certain services (or parts of services)? Are you happy with the amount of effort they have to put in? - Whether or not something is good or is a problem with regards to customer service all depends on your strategy. So a customer journey will significantly improve on force and value if your first create a strategy map for your organization. - Realistic Numbers. Calculate the financial benefits of your service desk employees instead of only the cost your service desk employees bring. 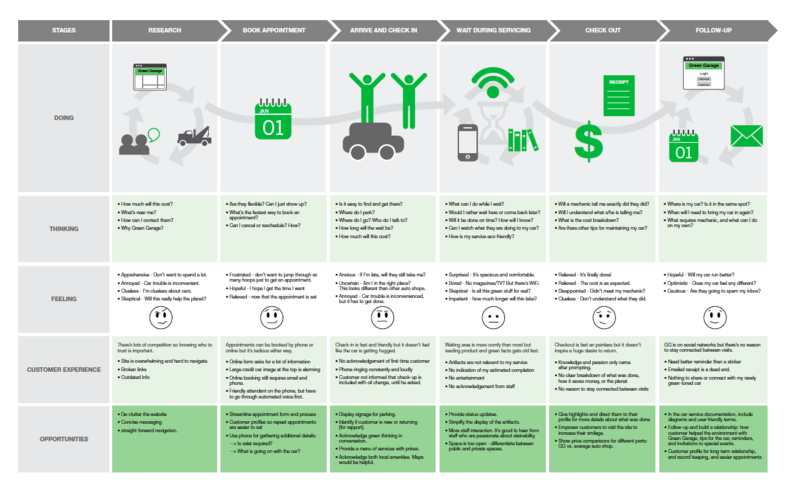 Do you want to create Customer Journey Maps yourself? 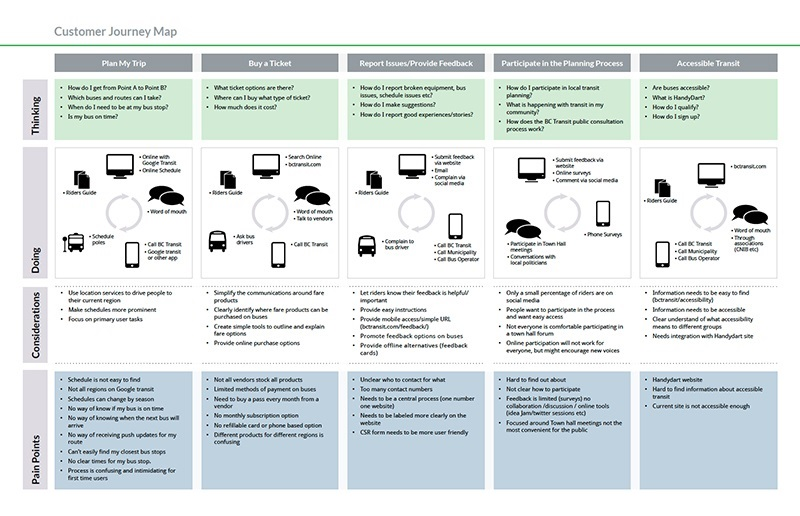 Also interesting to read and use is the Customer Journey Map template and the Business Model Canvas template.